The vibe in the 70s was very unique and these groovy 70s disco clothing items are sure to help you capture it. Some of these are a great idea for Disco theme parties and others you can wear every day. This fun shirt is sure to be a hit with any 70s disco fan. It is available in four different colors and it is 100% cotton. This 70's style shirt features a classic look and it is available in three different colors. A great choice for a 70s costume party or as a gift for a 70s fan. This groovy 70s roller disco T-shirt is very cool. Choose from 5 groovy colors to suit your vibe. This 70s disco jumpsuit is the perfect costume idea. It is available in black, white and red. These fabulous colorful disco pants are available in 7 different colors. They are perfect for any 70's theme party. This cool disco T shirt is great for a 70s costume. You could also wear it just because you love disco music. It is available in four different colors. This groovy disco shirt come in tangerine and in pink. It is a polyester button-up shirt. You will light up the room in this fabulous disco shirt. It is shiny and colorful which is exactly what you need at a disco. 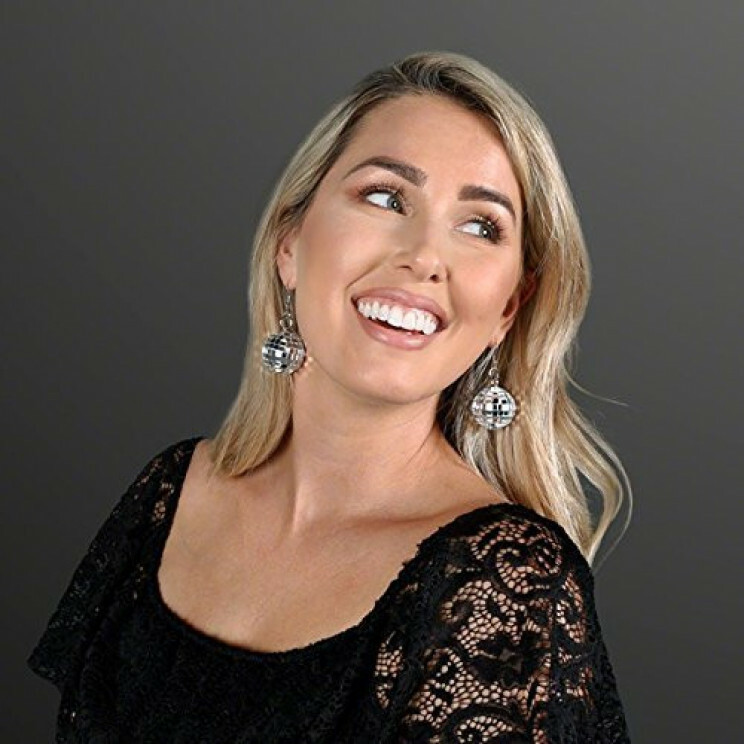 Turn almost any outfit into a disco style get up with these cute disco ball earrings. They are inexpensive and a great gift idea for any disco fan. 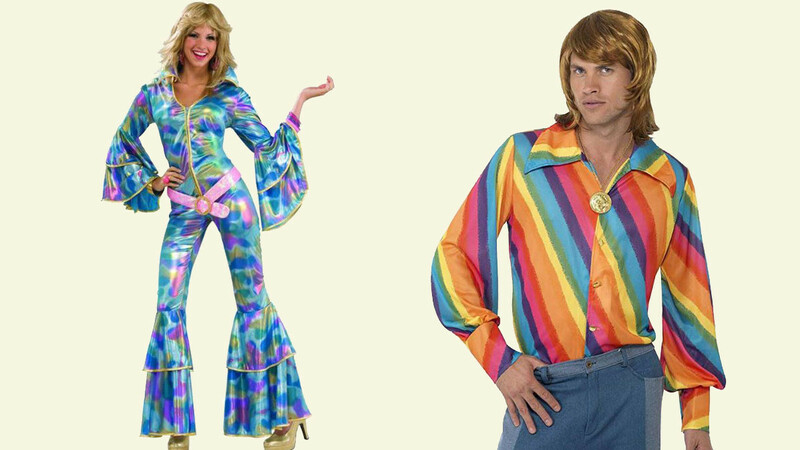 This set of groovy 70s disco clothing is a three-piece set. There is a shirt, pants and a scarf included. The outfit features classic 70s bell sleeves and flares. This bright and fun 70s dress is sure to put you in the mood to party. The matching scarf is included and multiple sizes are available. This zippered jumpsuit is colorful and sure to turn heads. The glittery pink belt is included and the jumpsuit is trimmed in gold. This 70s men's slack suit includes the pants, the waistcoat, and the jacket. There is a mock shirt in the waistcoat. The bright color makes this a stand out choice for any 70s costume event. Groovy 70s disco clothing is known for its bright colors. This set features a multi-colored top and bright yellow disco pants. The pants are designed with classic 70s style flares. This brightly colored rainbow shirt is a cool piece of 70s disco clothing. It is available in either large or medium sizing. The medium size is 38 - 40 inches and the large size is 42 - 44 inches. This is a button up, polyester shirt. This is the perfect shirt for anytime that you need 70s disco clothing. This sparkly shirt is covered in silver, reflective sequins. The shirt is hand washable and it is offered in two different sizes. Sizes available are Standard and Extra Large. This groovy 70s jumpsuit is offered in either blue or pink. The sizes available are small and medium. This shiny jumpsuit features silver detailing as well as flares and bell sleeves. This groovy 70s party dress is sure to make you look like the queen of the disco. It is available in pink, tangerine or purple. A matching headband is included with the dress.